The coastal cactus wren is found only in Southern California. Unfortunately, wren populations are declining and becoming more fragmented as a result of the loss and degradation of cactus scrub habitat. San Pasqual Valley, where the San Diego Zoo Safari Park is located, possesses some of the most intact cactus scrub in Southern California and supports the majority of the remaining wrens in San Diego County. 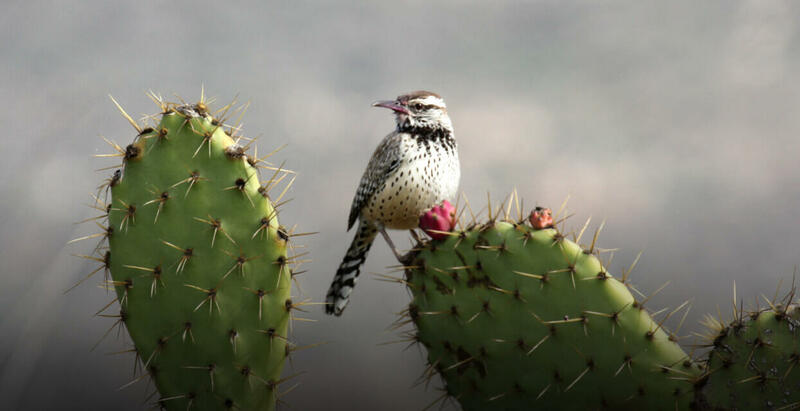 Because these birds require stands of healthy cactus for nesting, their survival hinges on the health of their shrinking habitat. Even in the San Pasqual Valley, recent wildfires and the high incidence of exotic and invasive plant species have resulted in habitat fragmentation. To address this challenge, a large-scale habitat restoration effort was undertaken by our Plant Conservation team. Restoration efforts focused primarily on increasing the amount of prickly pear cactus. Our labor-intensive cactus restoration efforts involved first determining the most effective cactus establishment strategies, including experimenting with headstarting cacti in nurseries, supplemental watering, and herbivory-prevention methods. Second, we modeled wren habitat occupancy and dispersal to determine where habitat enhancements would be most beneficial in terms of increasing the size, connectivity, and suitability of habitat patches. Results from our research not only inform ongoing restoration efforts, but are also shared with our partners throughout San Diego and Orange Counties. The effectiveness of restoration on coastal cactus wren populations is continually evaluated using several methods. Within the restoration areas, we are assessing various cactus establishment techniques to determine which are most effective. Wren populations are monitored by our Population Sustainability and Recovery Ecology staff using bioacoustics, visual/auditory counts, and nest censuses. In addition, we are surveying vegetation in existing wren territories to better understand the habitat requirements of this sensitive species. “Build it and they will come” has been the underlying philosophy for our restoration work to support the dwindling populations of coastal cactus wren, a species of special concern in Southern California.